BEIJING: Five people in southern China have been charged with intentional injury in the case of a Chinese teenager who sold a kidney so he could buy an iPhone and an iPad, the government-run Xinhua News Agency said on Friday. The five included a surgeon who removed a kidney from a 17-year-old boy in April last year. The boy, identified only by his surname Wang, now suffers from renal deficiency, Xinhua quoted prosecutors in Chenzhou city, Hunan province as saying. According to the Xinhua account, one of the defendants received about 220,000 yuan (about $35,000) to arrange the transplant. He paid Wang 22,000 yuan and split the rest with the surgeon, the three other defendants and other medical staff. The teen was from Anhui, one of China's poorest provinces, where inhabitants frequently leave to find work and a better life elsewhere. 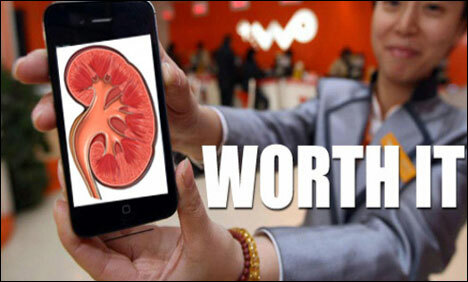 He bought an iPhone and iPad, and when asked by his mother where he got the money, admitted selling a kidney. Apple products are hugely popular in China, but are priced beyond the reach of many Chinese. IPhones start at 3,988 yuan ($633), and iPads begin at 2,988 yuan ($474). Wang's renal deficiency is deteriorating, Xinhua quoted prosecutors as saying. Only a fraction of the people who need organ transplants in China are able to get them, leading to "transplant tourism" where patients travel overseas for such operations, and to a black market for human organs.